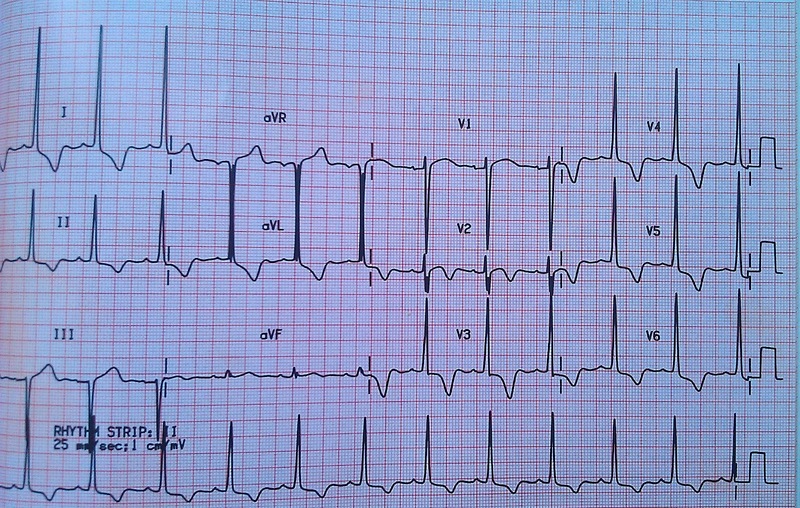 A 49yr old man presents to you with a 6 month history of chest pain. Sometimes this is triggered by exertion, sometimes at rest. He considers himself fit and active, so he light-heartedly dismisses his symptoms, and works through his 'mild' discomfort, which is very localised in the left upper chest, without radiation. He has no arm pain, no dizziness, and no breathlessness. In fact, he has only presented under duress from his wife. He is a non smoker, with no risk factors for IHD and not on any medication. On examination, as always, his BP is normal. However, you do hear a systolic heart murmur at the left sternal edge. His symptoms are indeed predictably triggered by exertion on every occasion these days, and whilst he considers them mild enough to continue exercising through, they will usually settle within a minute or two of resting. On the other hand, he also gets episodes which are totally unprovoked and out of his control which can be prolonged at rest. He admits that his symptoms have become more progressive in nature (in terms of both frequency and severity) since their onset, over the past 6months. He insists he has no dizzy spells, syncope, no palpitations and no family history of heart disease. He has alwasy made healthy lifestyle choices and has no risk factors for IHD. Have these new revelations altered your suspicions, or swayed the urgency of your management? ECG : Widespread T-wave inversion with chest pain at rest. It wouldn't be wrong to admit this man, on the basis of his rest pain, and ECG changes. You can't reassure him that nothing adverse will happen if he stays at home. Is this acute coronary syndrome? Has he had a recent cardiac event with ongoing T-wave changes and unstable symptoms at rest? Was there a recent episode of pain that was more significant than the others? On the other hand - he looks, and feels, quite well as he sits in front of you. He's clincially stable and given his dismissive nature, he may take some persuading to go in - but with rest symptoms he is at risk. At very least, this presentation should prompt an urgent referral to the RACPC. In the meantime he should be started on aspirin, a beta-blocker and a statin and given GTN/999 advice. The referral should include a copy of his ECG and make note of the murmur. (Note: Not all RACPC are set up with ECHO facilities, so if this information is included with the referral, an "ECHO on arrival" request can be made by the clinician receiving the referral). In this case scenario, the gentleman refused admission at time of presentation but an ECHO at RACPC confirmed severe Aortic stenosis. As such, an ETT was contraindicated. He required same day admission for monitoring, and an in-patient work up for diagnostic cardiac catheterisation to exclude coronary atheroma before dealing with his valve disorder. Aortic Stenosis as a cause of angina must not be missed. Aortic stenosis can cause cause anginal symptoms in people with healthy coronary arteries and it's management, is therefore, completely different. Treating someone with antianginal therapy for "IHD", when they actually have undiagnosed aortic stenosis a). won't help them, and b). is indefensible. Severe anginal symptoms in an individual with low risk factors for coronary artety disease should always raise suspicion - but most importantly - examinination for a murmur should always be sought in those patients presenting with chest pain. Frequently, prolonged severe aortic stenosis gives rise to voltage criteria for LVH on the ECG. 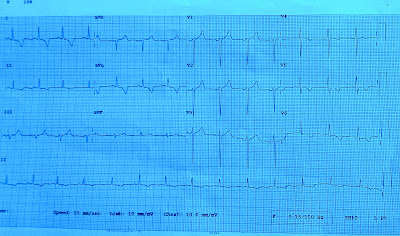 The above ECG shows no voltage criteria for LVH, and we know he is normotensive. However, in this second example, there is gross voltage criteria for LVH (fulfilled in Leads I, aVL, V1-6). There is widespread T-wave depression, and typical of LVH, T-wave inversion in the leads which face the left ventricle (i.e. leads I, aVL, v4-6). This 56yrs lady attends an appoitnment with your HCA requesting a 'well-woman' and blood pressure check. After 3 repeated measurements, a minute apart, her mean BP is 146/90. In accordance with the practice protocol, your HCA performs an ECG. 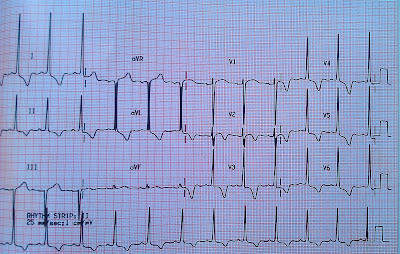 What is your impression of this ECG? Does her Blood Pressure need treating? 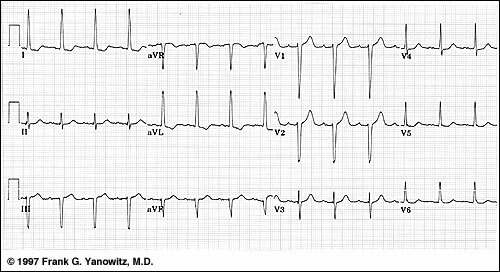 The main purpose of showing this ECG is to discuss the various voltage criteria for left ventricular Hypertrophy (LVH). This ECG is compatible with Left Ventricular Hypertrophy (LVH) in that it meets the voltage criteria for LVH, in leads I and aVL. As no other criteria for LVH are met, it is often better to say ‘This ECG meets the voltage criteria for LVH’, rather than diagnose hypertrophy. Don’t forget, LVH can only be truly diagnosed on scanned images, such as an ECHO. On crude eye-balling, the axis on this ECG is around -30 degrees ( -30 degrees falls within normal axis parameters). So whilst we have possible borderline Left Axis Deviation (LAD) it's probably not significant without a predominantly negative deflection in lead II as well. The ECG also shows T wave inversion in Lead I and aVL . When seen together, a leftward axis and T wave inversion, would further support the diagnosis of LVH and strain (see below). In accordance with latest NICE Hypertension Guidelines, you may want to offer this lady an ambulatory BP monitoring (ABPM), or Home BP monitoring (HBPM), for confirmation of diagnosis. Her CVD risk and any target organ damage, should also be assessed. Urinalysis should be checked for proteinuria, and bloods for underlying causes, or evidence of target organ damage (including U&E's, Glucose). Regardless of whether she turns out to have Stage 1 or Stage 2 Hypertension on the basis of her ABPM (see page 6 of NICE 2011 Hypertension Guidelines – CG127) her LVH will certainly sway you towards a lower threshold to treat. The clinic BP described for this lady is surprisingly low for someone with LVH and strain. In this situation, ABPM may demonstrate higher pressures than seen in clinic – known as ‘masked hypertension’ (a condition less recognized and less discussed than ‘White Coat Hypertension’) and that would reinforce need for antihypertensive treatment. More commonly, significant obesity can add to the effects of hypertension so an assessment of weight and lifestyle is also appropriate. Left ventricular hypertrophy is defined as an increase in the mass of the left ventricle, which can be secondary to an increase in wall thickness, an increase in cavity size, or both. LVH as a consequence of hypertension usually presents with an increase in wall thickness, with or without an increase in cavity size. Accurate assessment thus requires imaging with either echo or, even better, cardiac MR. Various ‘voltage criteria’ seen on ECG, however, can be suggestive of LVH. The predictive value of the voltage criteria is cumulative. i.e. The more voltage criteria met, the greater the likelihood of LVH. An ECG diagnosis of LVH is also more secure when there are associated ST/T wave changes rather than voltage criteria alone, as in the example above. 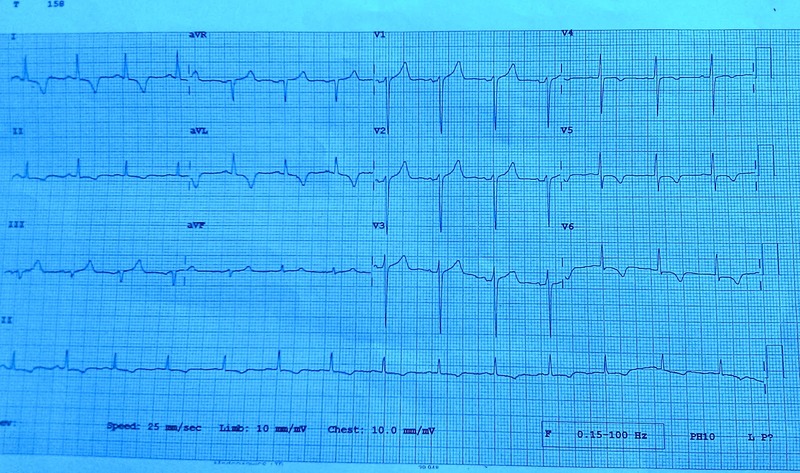 In the ECG above, the precordial leads do not meet the voltage criteria for LVH (arguably borderline, at 35mm). One of the most common questions I’m asked by GP colleagues when they see and ECG which is reported as ‘LVH’ is ‘do they need to request an ECHO?’ Generally speaking, unless it is likely to change your management plan, an ECHO is not required to confirm a diagnosis of LVH. If a patient with who is hypertensive is found to have LVH criteria on ECG, then an ECHO is only helpful if it will alter your threshold for treatment. If you plan to treat anyway, an ECHO is of dubious further value. As outlined above, voltage criteria for LVH in V1-V6 alone, in a tall thin person, without other cause for concern, it not necessarily indicative or LVH, and doesn’t need an ECHO. Conversely in an obese patient, the body fat between ECG lead and heart will result in a lower voltage in the precordial leads, and that may be the explanation in this case. So remember - Don't just look at the chest leads! Likewise, with an ECG suggestive of LVH in a normotensive person, an ECHO would only be indicated if a). Body habitus didn't explain the amplitude, or b). There was other signs/symptoms of concern (Possible HOCM? or Aortic Stenosis?). In such cases, there would often be other suspicious features on the ECG (such as T wave changes) or symptoms of possible cardiac origin. Sinister underlying causes are less likely on the basis of simple voltage criteria for LVH alone. •  The strain pattern is greatest in the lead with the tallest/deepest QRS complex (seen in Lead I and aVL in the example above). I hope this very simplified take on LVH helps clear up some of the conundrums around LVH, ECHOs and Hypertension – for GPs at least. Each 'term' is spilt into 5 cases launched a 2 weekly intervals. So here goes with the second case this term! This 56yrs lady attends an appointment with your HCA requesting a 'well-woman' and blood pressure check. After 3 repeated measurements, a minute apart, her mean BP is 146/90. What is your impression of this ECG? Is it normal? Does her BP need treating? Please feel free to join in and ask questions, or simply follow the conversation thread on Twitter - but most importantly….don't forget to use the hashtag #ECGclass in your responses!